Apologies if this is slightly off topic but does anybody know of a good scabbard maker in London? I recently acquired a lovely little sword from the late 17th Century at the biannual Arms Fair in Earls Court and I would like to have a scabbard made for it. Talk to Leo Todeschini of 'Tod's Stuff'. Based in Oxfordshire, which is close enough and he does gorgeous museum quality work. Following your suggestion I have looked at Leo Todeschini's page and it seems he does excellent work. I'm not prepared to pay quite that much for a scabbard at this point so shall search for another option however I very much appreciate your pointing me in his direction. 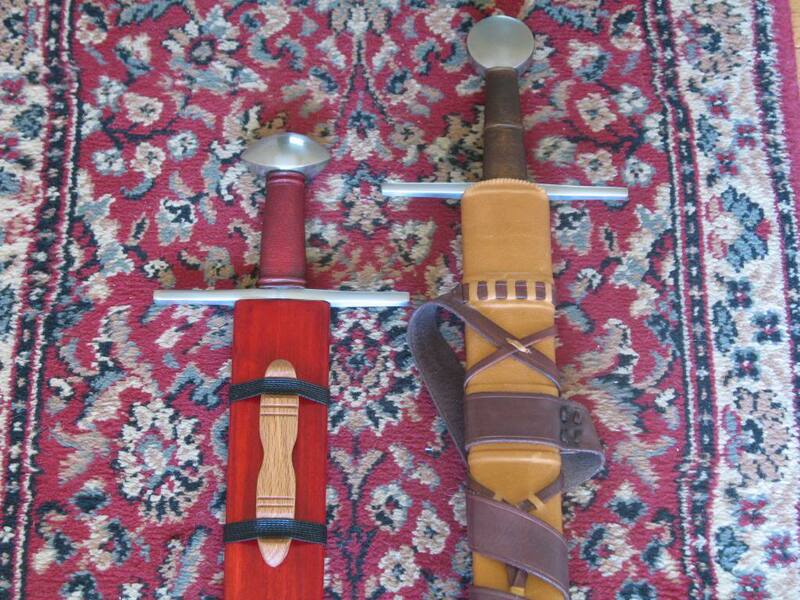 Both are nice but I especially like that Reeve scabbard. Well proportioned, neatly finished, etc. I built this scabbard in the spring for my dad's C9th-10th sword with piled core by the mighty Binns. Scabbard is lamb-skin lined wood core wrapped and stitched with veg tan, with a bit of foundation moulding and an internal, flat-topped and slightly undermined scabbard-slide fashioned from green horn, inspired mostly by the York leathers. Bellateare-inspired strap system with stitched veg-tan and some burnished loops of thonging to aid articulation. 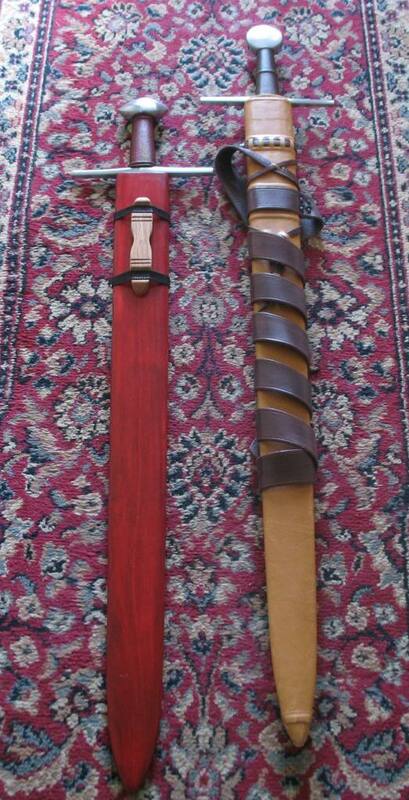 Crusader Monk Scabbard and Baldric for my Lonely Wolf 2 Handed Type X. The grip will be wrapped in Kangaroo lace to match the Baldric Straps. Hærtjener, a combination of ancient Norwegian words menaing army and servant. H aehr tche ner. Hærtjener was hand forged from 1075 high carbon and L6 tool steel, carved from antiqued cherry wood, and fitted with brass hilt components. All decorated to evoke the open seas and virtues such as integrity, justice, courage, & action. Crossbar & Pommel: Mahogany spacers and brass cap fittings. Very nice! I love pieces that have a special and deeply personal meaning for the owner. You are a fortunate guy. Here's the scabbard for my Albion Earl, by Brian Kunz at DBK Custom Swords ... note the triple longitudinal risers, and the scalloping at the throat which mirrors the Earl's pommel. I just wanted to show off this custom combo and see some of yours. It's a custom tinker with celtic symbols on the blade. The dagger is an Atrim. 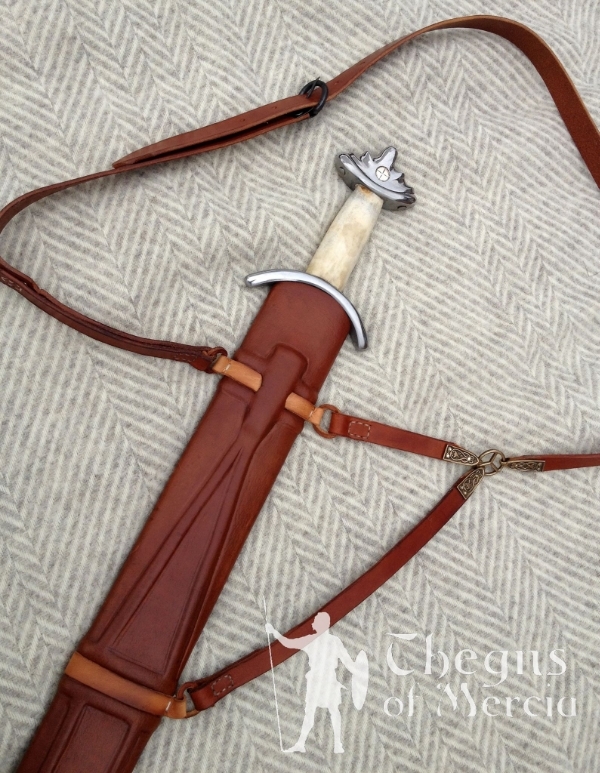 White scabbard and belt made by Sonny at valiant armoury. The dagger sheath by crusader monk. Its a Beast with the cutting due to the thick blade yet super light for what it is. Good thrusty to. It was made for another fellow custom, it didnt work out for the poor guy so i picked it up! its a single sword length with a two handed grip! 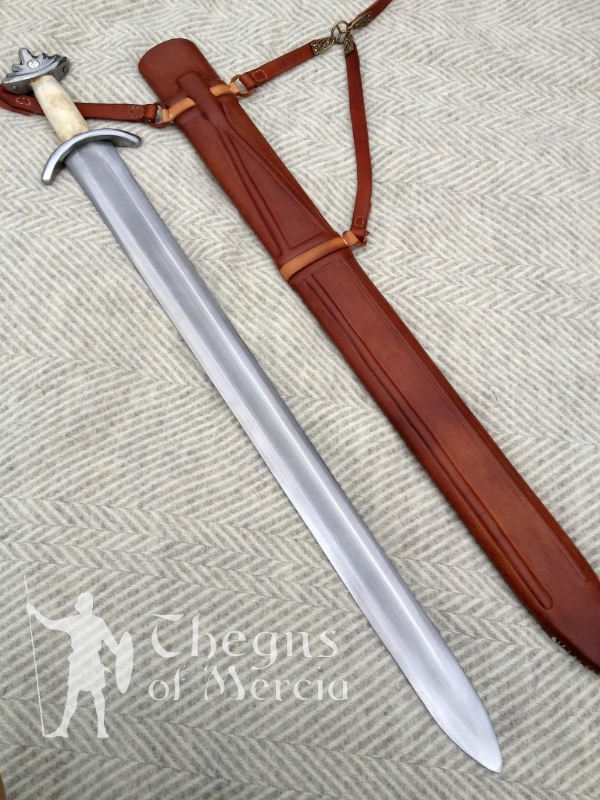 This picture is of the original Atrim leaf blade the hilt done by Christian fletcher. The Scabbard by its original owner! The dagger is from my original Atrim Leaf blade that broke so i turned it into a dagger! 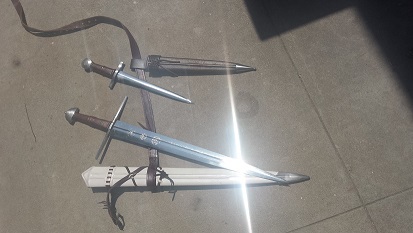 scabbard and hilt done by crusader monk. I'm just realizing how many scabbards/sheaths I've made trying to get it right. I feel like an absolute novice because I don't have these around anymore to remind me of what I've done. Stop being humble - they are outstanding. Thanks, Tod! I think I've mostly got the internals. I'm just starting to experiment with good leather because the costs are so daunting. 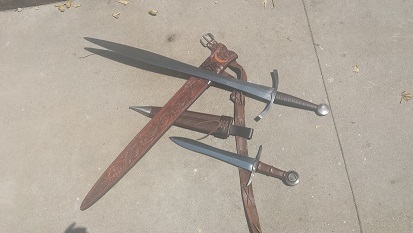 I think the knife projects are hooking me on the good stuff, and the German scabbards I love, with their tooling and integral by-knife sheaths, would seem to demand it. In an era of over-decorated scabbards and anachronisms, your scabbards excellently capture the elegant, dressed-down style of the 15th and early 16th centuries. You've even got a scabbard without a chape, something seen not infrequently in 15th century art, and yet shunned by most people who order their custom scabbard. So I say, let's see more of the same! What is that two hander in your third picture? You don't have a thread about it so where do you?